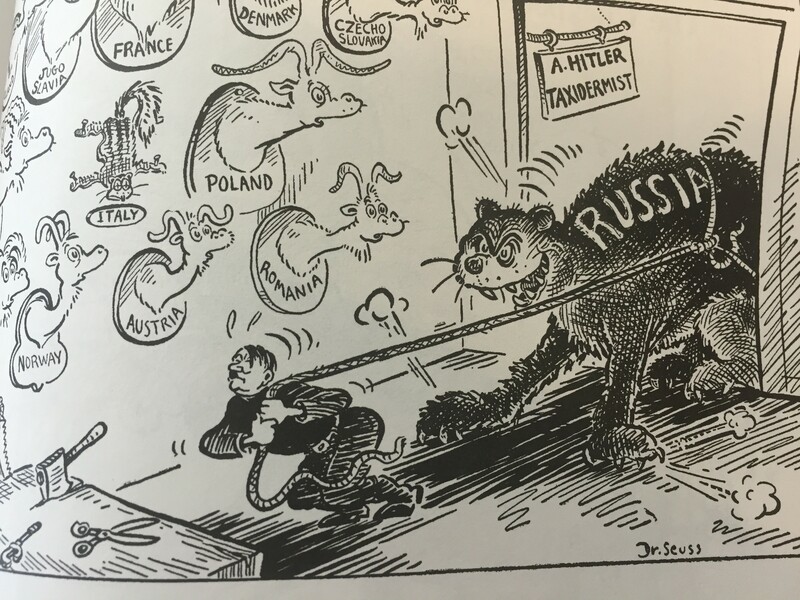 Did you know that before Theodore Seuss Geisel (Dr. Seuss) wrote children’s books and played with language he was a political cartoonist for PM, a favorite read for New Deal liberals? 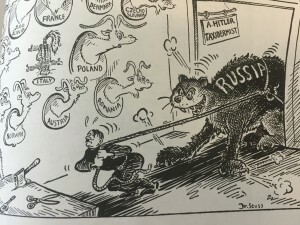 His cartoons are fiercely anti-fascist, pro-intervention and critical of anti-semitism and anti-black racism. They share the zeitgeist of the times undeniably racist in their portrayal of Japanese Americans, urging support for the war effort and caricaturing Nazi leaders. A book of these cartoons from 1941-42 with an introduction by Art Spiegelman is revealing of both contemporary attitudes about the war and Geisel’s illustration work before he became a renowned children’s author. Perhaps most startling some of his mythical beasts make an early appearance in these cartoons. Page through Dr. Seuss Goes to War for some surprises. What are you reading this cold April? I’ve just started a really fun biography, Irrepressible: the Jazz Age Life of Henrietta Bingham by Emily Bingham. It’s a wild ride through the roaring twenties and beyond with an outrageous heroine and the author is one of her descendants. 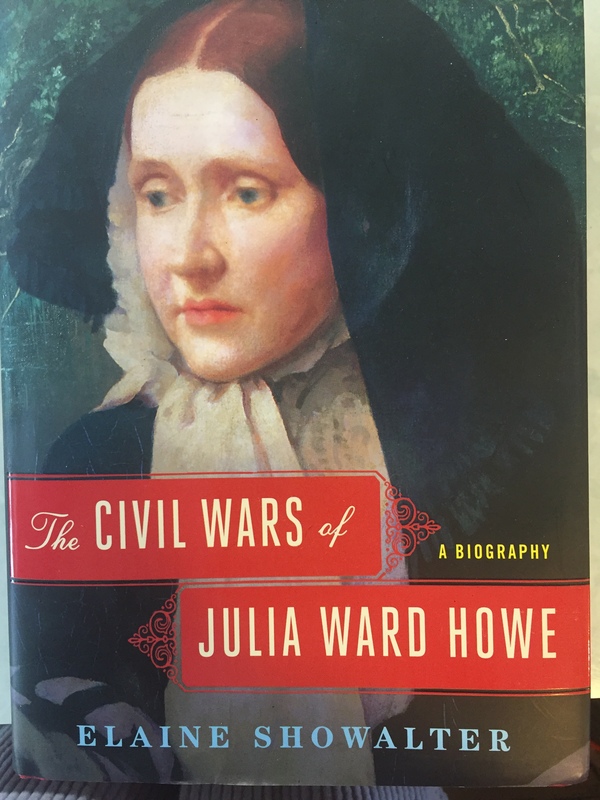 And, I’ve just completed the life of a very different woman living in an equally tumultuous time, The Civil Wars of Julia Ward Howe by literary scholar Elaine Showalter. 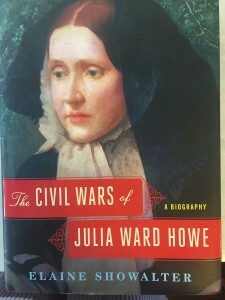 If you know JWH only as the author of the lyrics to the Battle Hymn of the Republic during the Civil War prepare to be surprised by this complex, highly educated and very political woman. There is something about the long slide from winter into spring that makes biography an especially compelling read — the narrative arc of a life from spring to winter is somehow comforting, reminding us that there is value in all the seasons. Read about a life different from yours, explore, challenge yourself! Breena Clarke has just released her third novel, Angels Make Their Hope Here. Breena, an Oprah Book Club pick for her first novel River Cross My Heart, has written a powerful novel. 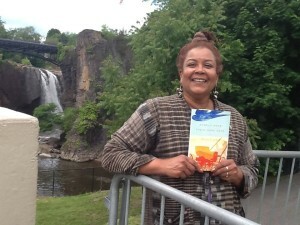 Its strong characters and dialogue draw you into the lives and experiences of a fictional free black, and mixed race community living outside of Paterson, New Jersey before the Civil War. Its a great story and you’ll learn some history too. The story of blacks living in the North is rarely told and in this novel the possibilities and limitations imposed by white supremacy are narrated with subtlety and a compelling attention to detail. Breena’s novel is published by Little, Brown, part of the Hachette group, who are currently involved in a huge dispute with Amazon over pricing e-books. Amazon is holding up delivery of Hachette authors. You can order her novel from any independent bookstore. 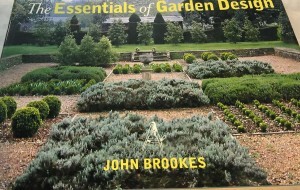 Visit her website breenaclarke.com for more information about how to get this fabulous book. Full disclosure her older sister, poet Cheryl Clarke, is my partner. I discovered Elizabeth Daly’s Henry Gamadge series by chance in Hobart’s own Mysteries and More bookstore. 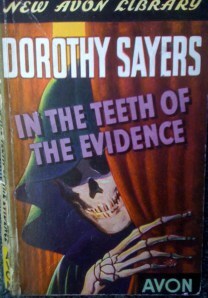 I was a bit put-off as the cover described her as Agatha Christie’s favorite writer (I am not a fan) but picked it up anyway. And I am glad I did. The books are intricately plotted (she was a life-long puzzle lover) have great dialogue and interesting characters. Her detective is a bibliophile who occasionally is called in to solve a puzzle by friends or family. 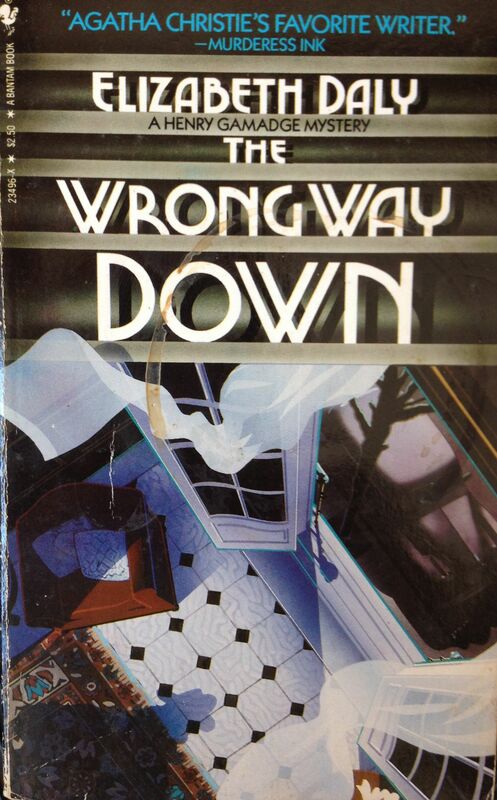 Set in New York City and its environs among the “best people” Gamadge, often working with the police, must solve the crime and save the reputations of those concerned. The books are a great foray into a forgotten world, just the thing for a summer afternoon. Pick one up at Mysteries and More! They are also being re-issued by Felony and Mayhem Press. Elizabeth Daly (1878-1967) won an Edgar in 1960 but is largely forgotten today. She was born in New York City, her father a New York State Supreme Court Justice and her uncle the well-known playwright Augustin Daly. She attended Miss Baldwin’s School, then earned a B.A. at Bryn Mawr College and M.A. at Columbia University. There are sixteen books in the series set between 1939 and into the post World War II era. 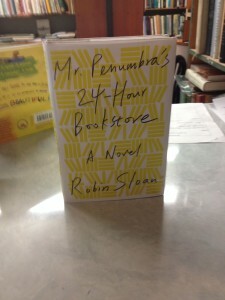 So the verdict i s in and from the most to least tech savvy all agree that Mr. Penumbra’s 24-Hour Bookshop is a great read. It reminded book club members of their favorite fairy tales, others of Tolkien’s Lord of the Rings trilogy and all agreed that the likable characters and central mystery made this book hard to put down. A great meditation on old knowledge (books, bookstores and libraries) and their relationship to new knowledge (Google, coding, laptops, 3-D printers) the author, Robin Sloan, explores what kinds of connections each from of knowledge makes possible. 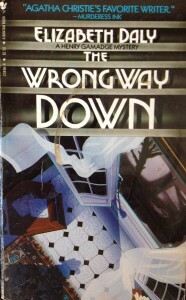 Many of the book club members particularly appreciated the networks and friendships that are used and generated as the main character Clay Jannon, a twenty-something out of work because of the recession and under-employed on the night shift at the bookshop, discovers and tries to solve the puzzle. He calls in friends, makes new ones and is befriended as he moves between utilizing new technologies and calling on old ones to crack the code. His quest takes him from San Francisco to New York, from Google’s campus to the mansion of a secret society. Along the way the book references everything from The Hobbit and Harry Potter to 2001 A Space Odyssey and even creates a entire science fiction series that helps guide the action! 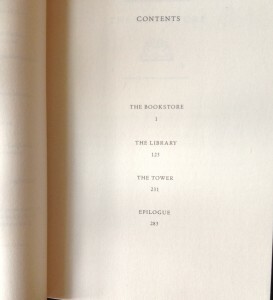 A great read, peruse the table of contents (below) and begin to discover the humor and magic of this book. Blenheim Hill’s new website, designed by Dann Tincher, is ready to launch. I am very excited and eager to commit to giving you all the bookish news from Blenheim. 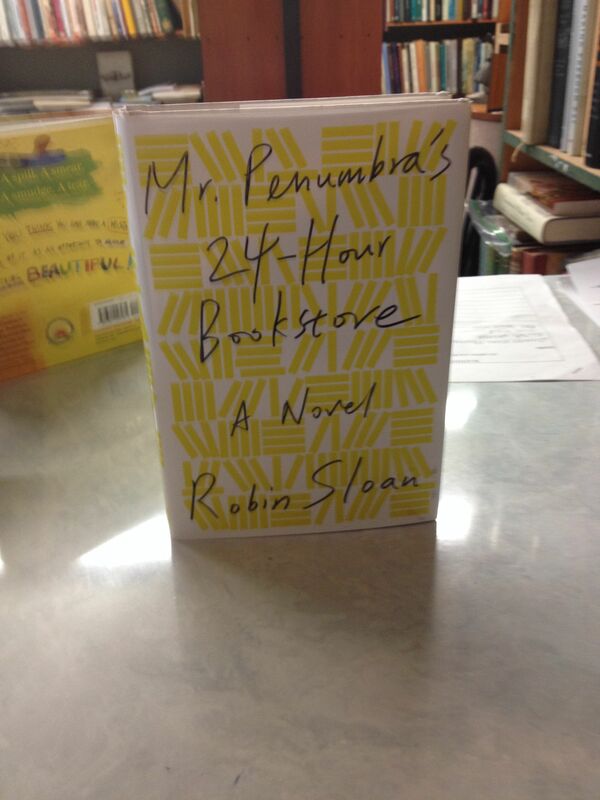 The Dorothy Marshall book club is gearing up to discuss Mr. Penumbra’s 24-Hour Bookstore by Robin Sloan. Initial reactions are fantastic — “loved it, laughed out loud reading it, learned a lot about new technology, loved the mystery and the characters”. Most of us would not have picked this book up to read and now we are all so glad we did. Stay tuned for the high points of our discussion tomorrow. Booksellers are frequently asked by their customers, where do you get your books? In upstate New York these are the books I found on my shop’s doorstep today: 1947 Girl Scout Handbook; 1944 Scottish Rite of Masonry, vol. 1; a nineteenth century volume of Dante; Habegger’s 2002 biography of Emily Dickinson and Solzhenitsyn’s epic novel August 1914, The Red Wheel Knot 1. Booksellers, unlike their customers, wonder why these books have been discarded, what links them in the reader’s mind? Although they are no longer wanted at home are they are too valuable to be thrown away, do they have sentimental associations, or …. 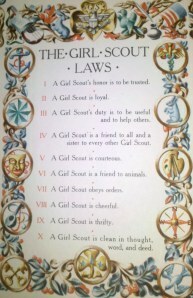 Only the Girl Scout Handbook appears to have been read, it is self tabbed directing us to specific sections including Arts and Crafts, Home Nursing, Home Making, First Aid, Nature and Badges. 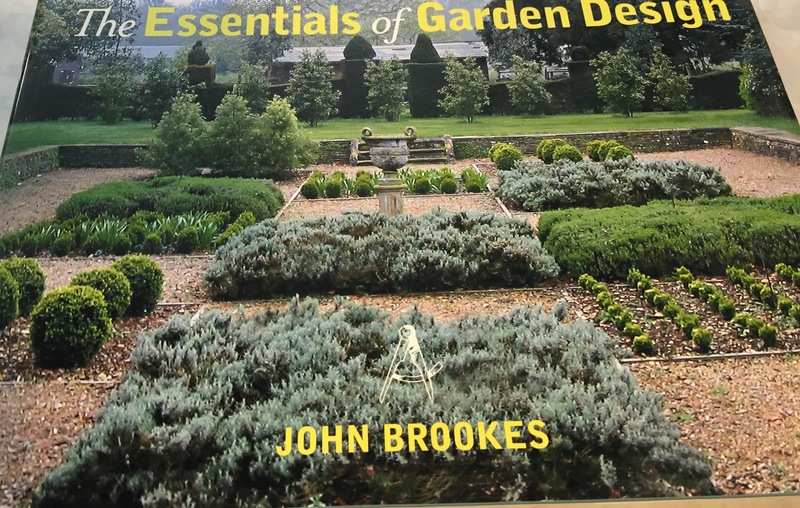 Perhaps superceded by a newer edition, or donated after the death of its owner, it was bundled in with the others and left for a new reader to find. The decorated, gilt-edged Dante is a reprint of the 1814 translation by the Reverend H. F. Cary by Chicago publishers Belford, Clarke and Co. Alexander Belford and James Clarke started their business in Toronto, moving to Chicago in 1876. By 1883 they had five branch stores, including one on East 18th Street in NYC. Their speciality — pirate publishing. Belford’s first book, published in 1867 when he was just 13 was pirated. They are perhaps best known for pirating Mark Twain’s Tom Sawyer. He sued them unsuccessfully for copyright infringement in the 1880s, commenting “Belford Bros., the miserable thieves couldn’t buy a sentence from me for any money.” The firm became notorious for pioneering new, aggressive, promotional techniques, including hippodroming (isn’t that the most wonderful word), opening pop up stores in towns too small to support a bookstore and selling off backlogged inventory at low prices. Considered unethical by many other publishers the firm went from success to success. Their greatest triumph was the firm’s Americanized, inexpensive version of the Encyclopedia Britannica. The British compilers watched as the Encyclopedia become a fixture in American homes and schools and decided to contract with the company to publish their inexpensive edition in Britain. A fire in 1886 destroyed their Chicago building and much inventory and the Panic of 1893 added additional financial stress leading to the break up of the firm. 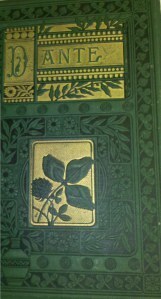 The Dante was published sometime between 1876 and 1889 doing its share to contribute to the profits Belford realized. Belford’s share of the firm amounted to over 3.5 million dollars at its dissolution. There was some money to be made in 19th century book publishing! A little research is a wonderful thing. I was intrigued recently by a small dense volume found at the bottom of box of cast off books, With Columbus in America. 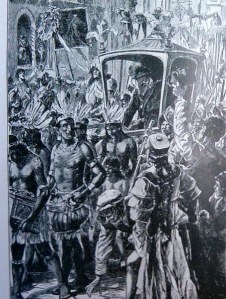 It is an illustrated account of the “romantic incidents of the discoverer’s life…worked into a fictitious narrative” and was published on the 500 year anniversary of Columbus’s “discoveries.” The profusely illustrated 1892 volume was ‘translated and adapted’ from the German by Elise L. Lathrop, and originally written by C. Falkenhorst. Falkenhorst (1855-1913) was the author of a series of historical, romantic fictional accounts about great explorers, including Cortez and Pissaro. While Falkenhorst might be more interesting to some, I was intrigued by Lathrop, who translated a wide range of authors and genres from German, Spanish and French for American publishers. Her translations were noted admiringly in reviews as ‘poetical’ , and well suited to the material she translated and adapted. Later in life, she authored Where Shakespeare Set His Stage (1906), Early Inns and Taverns (1907), Historic Houses of Early American (1936), and Old New England Churches (1938). These were prominent in a literature that helped to define and popularize the Colonial revival. She was an educated, working woman whose name was known to reviewers and whose translations made light romantic fiction from abroad available to American readers. The books she authored suggest either a deeply rooted New England past or a shrewd calculation about what would sell as each of her volumes was republished through the nineteen thirties.